Plantar fasciitis is one of the common foot ailments that produce a stabbing pain, which is most extremely felt during the morning especially after a long period of rest. This makes it difficult to get up from your bed. But it’s not just that — plantar fasciitis can be quite a burden and the pain may hinder you from doing your usual daily activities, playing your favorite sports or doing workouts. But don’t lose hope! There are a variety of home remedies to try at home before trying to do anything drastic, like having surgery. Aside from wearing the right footwear, one of the therapies you can try when you are suffering from plantar fasciitis is wearing a good pair of socks. Considering the importance of socks in the collection of running accessories, they play an essential role in treating your plantar fasciitis. Socks provide compression which minimizes the vibration which occurs when your feet hit the ground. Reducing the vibration can help minimize damage to the fascia since your arches serve as your feet’s shock absorbers. In addition, compression socks also aid in the proper circulation within the area, since adequate blood flow can help your body heal. How can compression socks help you? To keep your plantar fascia gently stretched and your feet neutrally aligned, the socks and sleeves fit tight on your legs. They can take away the soreness that you feel in the morning since they provide support. Another way the socks can help you is that they can be worn for longer periods of time, compared to ice which can only be left on for 20 minutes at a time or bandages which need to be taken off throughout the day. Compression socks can also be worn during the day, while you sleep, or both if that works for you. You are most likely to use them since they are more comfortable, which makes them more effective than something uncomfortable which you won’t use very often. You can tell a good pair of compression socks by its a nice and snug fit, which is only appropriate for word “compression.” They can keep your feet secure and stable, and help your fascia ligament keeping itself stretched while you are running, significantly reducing pain. Compression socks can be worn all day with minimal intrusion, unlike other supportive tools and devices. Sometimes, when you don’t want to wear bulky night braces to treat your plantar fasciitis, you can choose a pair of compression socks as an alternative. Needless to say, a good pair of compression socks will support both your feet and hold them tightly in your training and other physical activities. The luxuriously snug fit feeling of the socks will give you safety and comfort. Coming from an adequate brand well-known in treating foot ailments. Taut across the foot – Socks should be taut across your foot with no sagging material. These socks are made to promote blood flow to affected areas. More blood flow means your micro tears will heal faster and the agony associated with plantar fasciitis will disappear while your plantar fascia is gradually healing. Some people may not find immediate relief. These socks come in men and women’s sizes so that you can find the right size for your feet. Plus, they have fast drying fibers which prevent fungus and bacteria growth that will keep your socks smelling fresh. The stability that these socks offer will add to the overall support that your shoes give. They promote healing in any micro tears you might have and prevent new ones from occurring, by promoting blood flow to your feet. They may not provide enough compression. These sleeves have somewhat the appearance of socks, only without toes. They are designed to help with Plantar Fasciitis and have medical grade support. Plus, they are made of 76% micro-nylon and 24% spandex. These compression sleeves will help in healing heel pain because of the support they offer. They give you stability where the plantar fascia meets your heel, the area most prone to micro tears. This compression sleeve is made to relieve pain from plantar fasciitis. It keeps your plantar fascia in place as you move, and promotes circulation in your feet. This can be worn with or without socks and it can also be worn during the night to help relieve that annoying heel pain in the morning. This sleeve offers support to your plantar fascia which prevents micro tears because the sleeves will keep it from overstretching. The increased circulation in your feet will heal micro tears faster and it also prevents new ones from occurring. It keeps plantar fascia in place. It holds the arch steadily. It can be too tight for some. The SureSport Plantar Fasciitis sleeve can be worn by itself or underneath socks. It is breathable so that your feet won’t get too hot wearing it, and it is also made for ankle sprains, foot pain, heel pain, and plantar fasciitis. This sleeve is designed to give your compression as you move about your day. Its support will hold your arch steady, which keeps plantar fascia from overstretching and tearing. It also holds your ankle in place so your foot moves naturally. This sock is designed to anatomically fit your feet and gives support to your arch, heel. It also prevents blisters in the process. It also has lots of cushioning in areas where you need it most, such as the balls of your feet and the heel. 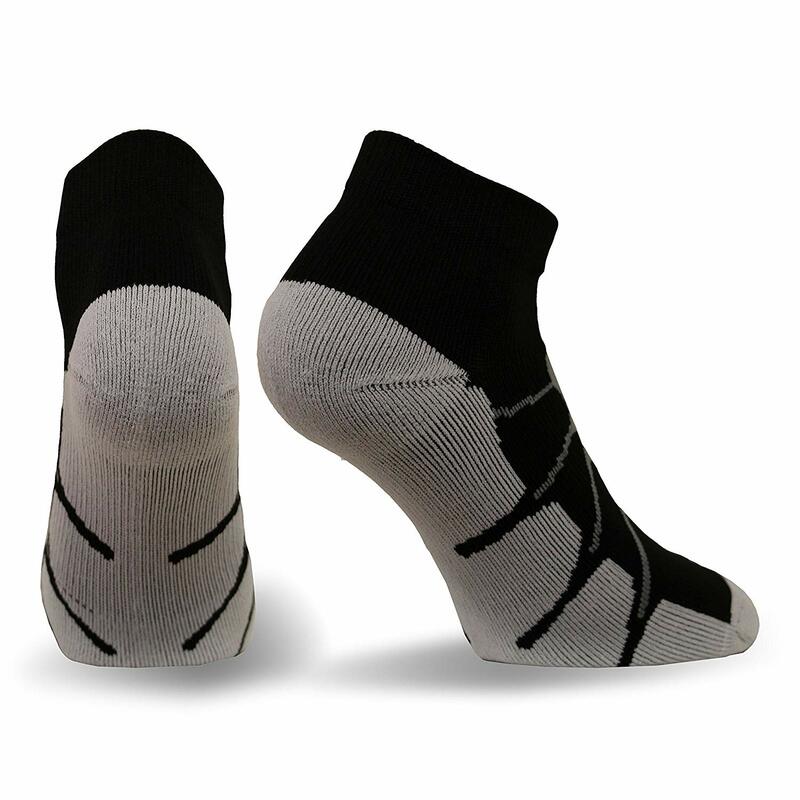 The cushioning of this sock protects your heel from the harsh impact it receives every day. It prevents micro tears from forming in the area where the plantar fasciitis meets the heel and also protects the balls of your feet. It has lots of cushioning. It may have durability issues. These compression foot sleeves help relieve pain associated with heel spurs, plantar fasciitis and other kinds of foot pain. These sleeves were designed by athletes so that they can be used for sporting activities or can be worn for everyday use. The design of this sock improves circulation in your feet. You will notice the micro tears in your feet healing much faster than before since these sleeves improve circulation in your feet. It also helps in developing muscle endurance by increasing oxygen flow in your feet and legs. It increases blood and oxygen. It does not have enough compression for some people. The Pire Plantar Fasciitis Sleeve helps in reducing pain and improves circulation in your feet. It is made of soft fabric and has a gentle, gradual compression which minimizes swelling in your plantar fascia. The arch support of this sleeve will keep your plantar fascia in place and prevents the arch from collapsing as you move. It keeps your plantar fascia in place. It does not have enough compression. These foot compression socks are designed to help heal plantar fasciitis. They also provide ankle, heel, and arch support to further reduce pain and the chances of micro-tears in your feet. Plus, they come in various sizes to find the perfect fit. These sleeves improve blood flow to your plantar fascia and decrease the likelihood of micro tears. They feature cushioning sleeves which absorb the impact from harsh surfaces. It provides ankle, heel and arch support. It may not provide enough compression for some. The compression you get from plantar fasciitis socks can be very beneficial and can aid in decreasing pain in the short term. Providing constant support through compression socks will expedite the healing process to the arch of your foot. The result is a significant reduction in inflammation and swelling in your plantar fascia.